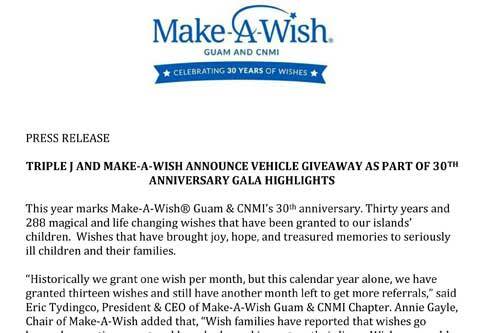 This year marks Make-A-Wish® Guam & CNMI’s 30th anniversary. Thirty years and 288 magical and life changing wishes that have been granted to our islands’ children. Wishes that have brought joy, hope, and treasured memories to seriously ill children and their families. 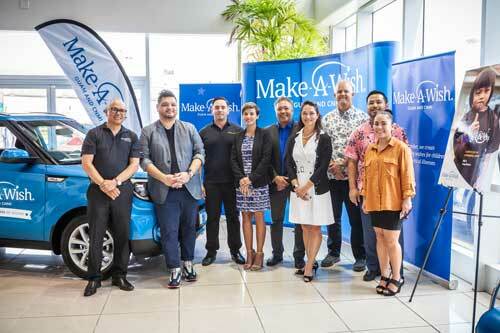 Make-A-Wish relies on the generosity of the community and its corporate partners to continue their mission of granting wishes in Guam and the CNMI. One of their signature fundraising events is their annual gala, and planning is underway to celebrate their 30th anniversary milestone. The gala will be held on Saturday, August 25, 2018 at the Hyatt Regency Guam. This year’s theme “Evening of Wishes”, will celebrate the stars of yesterday, today and tomorrow - our wish kids, our partners, donors and volunteers who have helped make all the wishes possible. It includes a five-course plated dinner and open wine table service, live entertainment and raffle prizes throughout the evening. There will also be a special guest attending the gala event Mr. Tommy Austin, one of the original founders of Make-A-Wish! The price for this year’s Gala ticket is $250.00 per person and $2,500.00 for a table of 10. Attire for the evening will be Black tie or Formal and sneakers. The highlight of the Gala will be a chance to win a 2019 Kia Soul EX with a retail value of $25,000, compliments of Triple J Auto Group. Tickets will be pre-sold for $100, at the Triple J Main Showroom in Upper Tumon, Triple J Honda in Tamuning and Docomo main office location in Tamuning, tickets will also be on sale the evening of the Gala. Only 400 tickets will be available for purchase, and you need not be present to win. Sponsorship of the 30th Anniversary Gala is an excellent opportunity for companies and organizations to show their support for the Make-A-Wish® Guam & CNMI Chapter. To learn more about becoming an event Sponsor, or event information and ticket purchase, contact Tom Valderama, Gala Chair or Anna Gera-Van Seters, Gala Co-Chair at info@guam.wish.org or call 649-9474. Make-A-Wish Board and Sponsor representatives at the Press Conference on Monday, July 30th at the Triple J Main Showroom, left to right: John Antenorcruz - Managing Director, TITAN Imports and Make-A-Wish Board Member; James Santos - Senior Manager, Visual Merchandising, DFS Group and Make-A-Wish Board Member; Joaquin Cook - President, Bank of Guam and Make-A-Wish Board Member; Kamia Dierking - Director Marketing & Communications, GTA Teleguam and Make-A-Wish Board Member; Ana Maria Gayle - Attorney, Office of Public Defender and Make-A-Wish Chair; Jay Jones - Senior Vice President, Triple J Auto Group and Make-A-Wish Vice Chair; Nathan Taimanglo - Chief People Officer, Docomo Pacific and Diamond Sponsor of the 30th Anniversary Gala; Leslie Charfauros - Account Executive-Enterprise Sales, Docomo Pacific.